Two weeks ago, the celebrated chefs of London, England participated in a one-day campaign they called "Cook for Syria." Carryout shops and fine restaurants sold traditional Syrian dishes and sent the income to support that long suffering country's children. The idea was schoolbooks, footballs, food and clothing. The bigger idea was to publicize, prepare and promulgate Syrian food, so those out of that country's line of fire could be reminded of its people and their unspeakable suffering. The idea was to somehow say: "You have not been forgotten." This well-timed antithesis of exit, disengagement and isolation was a way to flaunt human commonality. The exit from that is extinction. Shortly after I read about this culinary goodwill, I made Syria's beloved comfort food Harak Osbao. The translation is Burnt Finger, for in older times people couldn't wait to eat this tasty combination of lentils, macaroni and fried onions and supposedly stuck their hands into the hot pot I went big. I made enough to share with my Saturday Dharma group that always ends with a potluck lunch. Before I served it, I explained why we were eating this at this moment: #CookforSyria. Nobody had ever heard of anything like it before. But everybody was familiar with lentils, macaroni and fried onions. Nothing scary here. They dug right in. I figured that would happen. Although people who don't think much about their food think I'm nuts, I have long believed that cooking and/or eating somebody else's food is an honest way of communing with them. I got started when I came back from Europe in 1962 and tried to recreate the food I had there so my trip wouldn't really end. Much later I became the Western expert on Himalayan food because I deliberately learned to cook it in order to better understand my Rinpoche, his monks and their surround. 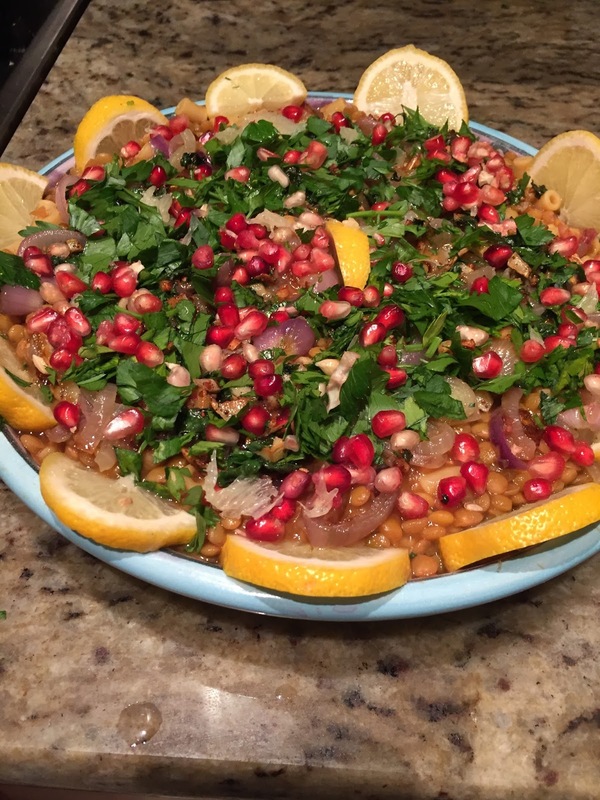 #CookforSyria was me doing what comes naturally. I was already sprinkling Aleppo pepper on any dish I could, not just because its subtle heat makes the food more enticing. Every time I held the bottle with that word Aleppo on its label, I remembered the people who created and brought the spice to me, innocents afflicted by unimaginable suffering, including deliberate famine. I wished them well. joyfully keep the nation's cultural identity alive by using Aleppo pepper and preparing Harak Osbao, spreading them around. Hopelessness never has to be the default option. When students lament something terrible happened--a chronic illness, a sudden death, a rent relationship, a political nightmare, a lost cause--and there's nothing they can do, Rinpoches and lamas always say there is indeed something: tonglen. This is the Dharma practice more commonly referred to as sending and taking because you harness your natural breathing cycle to send out all the love and positive energy you can muster and breath in all the black pain and suffering of whoever is your concern to take it them from them. This is how you cleanse your world: send white light and love on your out-breath; remove darkness and distress with your in-breath. People are often terrified to do this. Exhaling love and light feels tentatively manageable, but the business of taking in and thus taking on somebody else's disease, death or distress is horrifying. Why would anyone dare? Who wants to get cancer or bombs? Our poor teachers must work intensely to point out this exercise is simply you breathing naturally in and out. Absolutely nothing else is happening. You are in no danger of getting infected by HIV or Ebola or hit by bombs. You're going to get out alive. You are simply sitting still breathing the invisible air around you in and out while focusing your mind and energy on your desire to help someone. It takes getting used to. Our teachers will also admit, when questioned, that tonglen offers no direct tangible result, no real remedy for the problem. Doing it is definitely not going to cure cancer, delay the divorce or destroy enemy lines. In truth, you are not sending and taking to improve the other who is your object of concern. You are doing it to benefit yourself. Tonglen is the exercise that develops your empathy muscle, reduces swelling of the ego and sharpens mental perceptions. It teaches you to acknowledge suffering and be unafraid to face it. Essentially tonglen is compassion fitness training. So in a way is cooking. It has always seemed to me that taking in the food of someone other is sending them gratitude, respect, even love. It represents appreciation and neuroscience is now telling us what all human beings have in common is the intense need to be acknowledged and appreciated. Eating what others eat makes you one with them in a bright and joyful way. Afterward, you usually end up breathing out thanks for that delicious dish they brought to your table, for the blessing of their existence. #cookforSyria. You can look up recipes. Essentially you cook up about 1 1/2 c brown lentils in vegetable broth until almost soft, then throw in a cup of small macaroni and 2 tbsp pomegranate molasses, 1 tbsp salt and 1 tsp Aleppo pepper. If you have tomato paste around add 2 tsp. Cook til the macaroni is soft. Hopefully the liquid dries up. If not drain it out. Meanwhile cut two red onions into thin rings and saute them in olive oil until they're caramelized, about 12 minutes, without burning. Put them on a plate and put 4 cloves minced garlic with more olive oil in the pan and brown the garlic. remove from heat and add 2 tsp sumac and handful of chopped cilantro. Pour the lentil/macaroni mixture into a large shallow serving dish. Top with the onions, then the garlic mix. 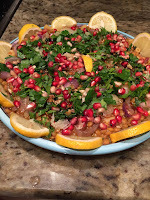 Top all that with freshly chopped flat leaf parsley, some pomegranate arils and lemon juice or lemon wedges. Enjoy! 'I wish I could show you, When you are lonely or in darkness, The Astonishing Light Of your own Being"
It really is there if you put down your not so smart phone and take the time to look for it.